When is a frozen vegetable not a frozen vegetable? Chris James and Steve James review research on supercooling in fruits and vegetables. Recently FRPERC was approached for a legal opinion regarding the freezing of garlic bulbs (Allium sativum L.). A company had reputably been importing ‘frozen’ garlic bulbs at a temperature of -6°C, however the UK Customs questioned whether it was ‘frozen’. An independent report by another research organisation had made an assumption that freezing would cause clear and obvious changes to the colour and structure of the cells in the garlic cloves (as can clearly be seen in the photo above). They did not find this in garlic cloves that they inspected, hence they concluded that the samples had not been previously frozen. However, a short experimental study carried out by us indicated that the degree of freezing, and potentially damage, within a clove of garlic was not only a function of temperature but is also influenced by the rate of temperature reduction and possibly by the length of storage time. We also found unusual supercooling characteristics that indicated that garlic cloves may not always be in a frozen state at a temperature of -6°C. This initiated further studies by us into the supercooling characteristics of garlic (published recently in the International Journal of Refrigeration; James et al., 2009), and other vegetables, such as shallots and cauliflower (yet to be published). The phenomenon know as supercooling (also referred to as ‘undercooling’ or ‘subcooling’) is where the temperature of a solution or material is reduced below its freezing point without crystallization occurring due to an energy barrier that must be surmounted before nucleation starts. When crystallization begins the temperature is raised to the freezing point. When ice crystallization occurs, there is a corresponding increase in temperature (due to the latent heat of ice crystallization) from the supercooled temperature to the freezing point (Cox & Moore, 1997). The point at which nucleation is initiated may be referred to as the ‘nucleation point’ or ‘metastable limit temperature’ (Cox & Moore, 1997). Although supercooling has been studied in pure water and other liquids, there is little published data on supercooling in solid foodstuffs. References to supercooling in fruits and vegetables are spread far and thin. Many of the published studies regarding supercooling in fruits and vegetables have been concerned with this phenomenon in growing plants (Pearce, 2001) and its role in frost damage and frost resistance. The few studies that have observed supercooling in any detail in fruits and vegetables during storage have reported its occurrence in apples (Diehl & Wright, 1924), grapes (Lucas, 1954), navel oranges (Lucas, 1954), lemons (Lucas, 1954), tomatoes (Cox & Moore, 1997), and strawberries (Martins & Lopes, 2007). As early as the 1920s, Diehl & Wright (1924) reported that isolated apples could sometimes be cooled to a point as low as 4°C below their freezing point without ice formation, provided the fruit was left undisturbed. Lucas (1954) cited other early studies showing 3°C and 1.5°C of supercooling in grapes and navel oranges, while his own study, in 1954, on lemons reported nucleation points of between -3.9 and -4.4°C in whole fruits cooled in air, while a nucleation point of -6.1°C was reported in whole lemons cooled in alcohol. Supercooling of tomatoes was used as an example in a more recent patent on a process for supercooling by Cox & Moore (1997). Two individual, unreplicated, trials showed that two fresh tomatoes had nucleation points of -4.3 and -4.5°C. In a separate experiment no evidence of ice crystallization was apparent on visual inspection of the interior of a tomato cooled to an internal temperature of -3.8°C in a ‘water’ bath at -4°C. Fuller & Wisniewski (1998) measured ten independent nucleation events on the surface of a cauliflower curd cooled to -10°C at a rate of 15 K h-1, ranging from -6.5°C to -9.5°C. Supercooling in frozen strawberries and its effect on ice crystal size and formation was investigated by Martins & Lopes (2007). Their data showed a difference between nucleation and freezing point temperatures measured on the surface or centre of strawberries. Nucleation temperatures at the surface of strawberries ranged from -0.3°C to -9.2°C and freezing points ranged from -0.1°C to -4.1°C. While nucleation temperatures in the centre of strawberries ranged from -0.3°C to -4.6°C and freezing points ranged from -0.1°C to -1.4°C. In our recent work, we have found that peeled garlic cloves demonstrate significant supercooling during freezing under standard conditions and can be stored at temperatures well below their freezing point (-2.7°C) without freezing. The nucleation point or ‘metastable limit temperature’ (the point at which ice crystal nucleation is initiated) of peeled garlic cloves was found to be between -7.7°C and -14.6°C. Peeled garlic cloves were stored under static air conditions at temperatures between -6°C and -9°C for up to 69 hours without freezing, and unpeeled whole garlic bulbs and cloves were stored for one week at -6°C without freezing (see below). 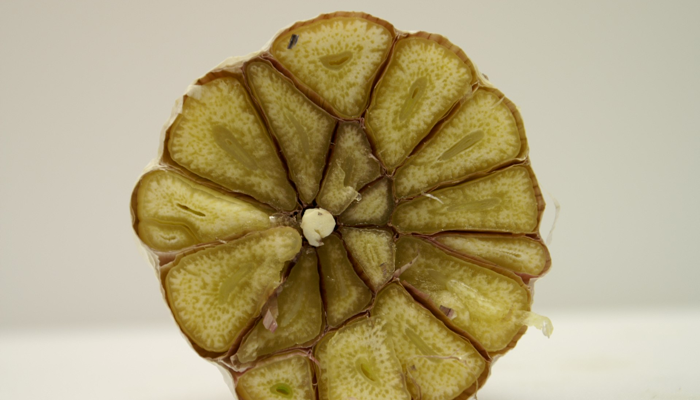 Further work has demonstrated that whole garlic cloves can be stored for substantial periods of time below their freezing point without freezing and without any detrimental effects to their quality. We have also observed significant supercooling in other vegetables, such as shallots and cauliflower. There are two forms of ice nucleation, spontaneous (homogeneous nucleation) and that catalysed by another substance (heterogeneous nucleation) (Pearce, 2001; Zachariassen et al., 2000). The lower limit for homogeneous nucleation in plant materials is -38.5°C (Pearce, 2001). However, homogeneous nucleation is rare in biological systems since there are many intrinsic and extrinsic substances present in nature that can act as heterogeneous nucleators (Pearce, 2001), including: (a) ice nucleation-active bacteria; (b) other biological molecules and structures; and (c) organic and inorganic debris. Thus the factors that affect the degree of supercooling are not the same as those that determine the freezing point. Lucas’ (1954) states that the amount of supercooling is independent of rate of cooling, time at a given temperature, cell size, or osmotic pressure. Other authors state that cell size and osmotic pressure are factors favouring supercooling (Fanyi et al., 2002). Other factors that appear to favour supercooling are: low moisture content, little or no intercellular space for nucleation, absence of internal nucleators, barriers against external nucleators, and the presence of anti-nucleators (Pearce, 2001; Levitt, 1980; Fanyi et al., 2002). The role of extrinsic and intrinsic nucleators in plants and nature has been reviewed in detail by Pearce (2001) and Zachariassen & Kristiansen (2000). One of the main extrinsic nucleators cited is surface moisture. Many authors report that ice nucleation can be facilitated in tests of the frost hardiness of plants by spraying water on the surface of the plants prior to freezing (Fuller & Wisniewski, 1998). Although Lucas (1954) did not show that the humidity of the surrounding air or moisture on the fruit surface had any effect on the ice nucleation point in trials on detached lemons. In our experiments peeled and unpeeled garlic cloves were stored in dry ambient conditions before use so there was little, if any, surface moisture available to initiate nucleation thus this may be a factor in the low supercooling temperatures we have observed. In many plants the most commonly reported intrinsic ice nucleators appear to be of bacterial origin (Fuller et al., 1994). However, plants themselves also contain non-bacterial nucleating agents, some of which function at relatively high temperatures (Pearce, 2001). The ability to supercool appears also to be genetic and heritable (Fuller et al., 1994). It is thus possible that current work into biotechnological manipulation of plants to improve frost hardiness may also result in the production of fruits and vegetables with increased supercooling characteristics. Environmental conditions during growing will also alter supercooling characteristics (Pearce, 2001). Being plant bulbs it may be assumed that garlic bulbs and cloves have some inherited resistance to frost damage and that this translates in their ability to supercool, however we have been unable to identify any studies into supercooling in plant bulbs that substantiate this hypothesis. 1.Identify how significant supercooling is in other vegetables. 2.Determine which specific intrinsic bio-chemical properties (chemical (solutes) or biological (properties of the cells) composition) and extrinsic factors, (such as surface moisture) affect the freezing and supercooling point of vegetables such as garlic. 3.Investigate the effect of blanching. At present we do not know if blanching affects the freezing point, or the supercooling, of garlic. 4.Quantify the long-term storage life of vegetables in a supercooled state. Freezing extends the storage life of food by reducing the water activity of the food and thus deprives the bacteria of water required for growth. In a supercooled food water is still available. Thus it may be supposed that microorganisms may be able to grow in a supercooled food, though at a significantly slower rate than in chilled foods. Cox, D. R. G. & Moore, S. R. (1997) A process for supercooling, Patent WO 97/18879. Diehl, H. C. & Wright, R. C. (1924) Freezing injury of apples. Journal of Agricultural Research. Vol. 29, pp0099-0127. Fanyi, S., Wenji, L., Rongfu, G., Wenjie, Z. & Qi, Z. (2002) Thermodynamic analysis of the mechanism of deep supercooling of tissue water in winter-hardy plants. CryoLetters. Vol. 25, pp141-150. Fuller M. P., White, G. G. & Charman, A. (1994) The freezing characteristics of cauliflower curd. Annals in Applied Biology. Vol. 125, pp179-188. Fuller, M. P. & Wisniewski, M. (1998) The use of infrared thermal imaging in the study of ice nucleation and freezing of plants. Journal of Thermal Biology. Vol. 23:2, pp81-89. James, C., Seignemartin, V. & James, S. J. (2009) The freezing and supercooling of garlic (Allium sativum L.). International Journal of Refrigeration. Vol. 32, pp253-260. Levitt, J. (1980) Responses of Plants to Environmental Stresses, Vol. I. Chilling, Freezing and High Temperature Stresses, Academic Press, New York, US. Lucas, J. W. (1954) Subcooling and ice nucleation in lemons. Plant Physiology. Vol. 29, pp245-251. Martins, R. C. & Lopes, V. V. (2007) Modelling supercooling in frozen strawberries: Experimental analysis, cellular automation and inverse problem methodology. Journal of Food Engineering. Vol. 80, pp126-141. Zachariassen, K. E. & Kristiansen, E. (2000) Ice nucleation and antinucleation in nature. Cryobiology. Vol. 41, pp257-279.